Many people admire UES’s sock because of comfortable fit and durability even though standard design. Today, we would tell you the secret of toughness. We use double-thick thread compare to common socks. Thickness has reference to the high durability. So we special order them. 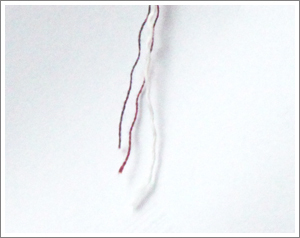 And also native unevenness yarns give simple and natural texture on surface of socks. *10/1 Cotton100% and 10/1Cotton 50％acrylic are yarns of common socks. *We use mottled yarn and ecru yarn. *Those graphs show you that our threads are twice or three times the strength and stretch of the common socks. Threads are made by twisted fiber when spinning. Then finished threads are twisted, they are three-ply threads. Common socks usually use single-ply thread or double-ply threads. To apply three threads improved our quality. Let’s look at rubber, top stretch part of socks. We use polyurethane modified rubber to keep them from deterioration. 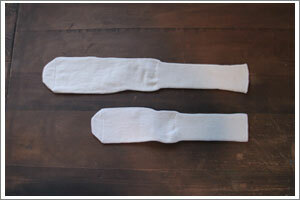 Some common cheap socks are made with natural rubber and it is easy to be worn out. Long lasting comfortable fit is because of good material. Our socks are made in japan. 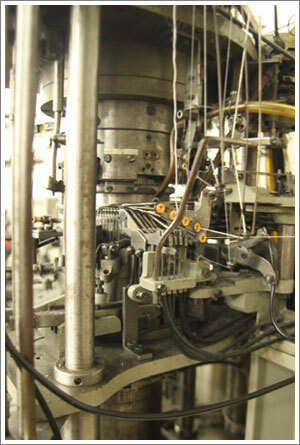 Domestic manufacturing has lot of advantages in quality control. Especially we can express our brand concept to make durable products to workmen. Items are machinery manufacturing but operator is humans. So it is important for them to understand product’s goal. They make effort to make socks with tension adjustment, understanding machine’s character and so on. Copyright UES OFFICIAL ONLINE STORE Rights Reserved.